Viceroy Studios have come up with a unique and amazing idea that has the power to revolutionize esports. 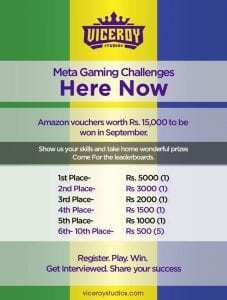 They’re holding gaming challenges for popular games, which are called “Meta Gaming Challenges,” or MGCs. You have to complete these challenges, which are no rocket science as compared to in-game challenges or achievements. Once you do, you will submit a screenshot proving the legitimacy to [email protected]. 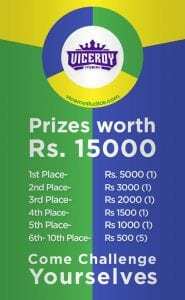 Prizes worth ₹15,000 to be won in this month’s MGC. The games chosen this month are LoL, DotA 2, CS:GO, and Dark Souls III. The Challenges will be generally different in different months, but the games can repeat. To check more details and the rules of the four games to accomplish a Challenge, read the official page on Viceroy Studios Gaming. Viceroy Studios is new in esports, and already coming with a blockbuster idea. One can only imagine what lies in store for future. I got a chance to read some of their official documentation regarding e-gaming in India and their future aims. To be honest, I was surprised to see such a healthy dedication. They have firstly run a full business analysis on the industry, the money it racks up, the growth it will witness in the close future, the career opportunity it provides, the acceptance of esports in society, and so on. The most impressive point, however, is their commitment to take esports to the Olympics and the recognition of on-screen gaming as real athleticism. We gamers need to be called athletes – that’s what I loved most about it. After doing research on the scope and potential of the global esports community, Viceroy Studios have crafted progressive goals towards the popularization of this industry. They’ll be starting from motherland India. Out of their many future aims, the central ones are kicking up a structured online league system, global content reviewing, the MGCs, community features, and having interactive portals to engage gamers using technologies like websites, forums, chat, etc. I won’t stretch it out too much, but the league system deserves a special mention. It’s a multi-dimensional event spread over two 4-month periods each year. It will be a huge tournament that supports live broadcasting, making of highlight videos, and catering to fans by inviting known professional Shoutcasters. Of course, sponsors can invest here to get more exposure. This is a great way to get more followers and fans for professional gamers. With a powerful marketing strategy and brand growth prospects, Viceroy Studios are something both gamers and businesspeople can trust in – trust that yes, finally we have someone who will make radical changes to esports and explore modern, creative areas to be investing resources in. 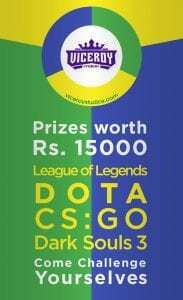 Gaming is a digital performing art, and needs a skillful mind, an affinity with making effective strategies, teamwork ethics, and creative and artful methods of solving problems. It’s high time we see more upstarts aimed at propelling esports as a real profession.